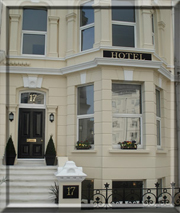 Welcome to 17 Wilmington Square - a family run hotel in the heart of Eastbourne's theatre land and close to the famous Queen's Tennis Club. The hotel is situated just a short walk away from the seafront and Eastbourne's elegant Victorian promenade. Ideal accomodation for people visiting Eastbourne's new Cultural Centre or The Winter Garden. We offer two king junior suites, four doubles and two twin rooms all with en suite facilities. Our front rooms have enviable views of the sea, wish tower and the Devonshire Park theatre. Rooms include all the essentials you would expect from a quality establishment. Enjoy our full English breakfast made with fresh farm eggs and locally made sausages, also available is smoked salmon, scrambled eggs and a buffet of cereals, yoghurts and fruits. Packed lunches are available including special picnic hampers during womens' tennis week. Eastbourne is ideal for golfers with the Royal Eastbourne and Eastbourne Downs Golf Clubs less than 2 miles away from the hotel.